Outside of my front door, I crave variety: new restaurants; unexplored running routes; fresh travel destinations. Step across that threshold, however, and you’ll find a girl cozied up in the same scruffy blanket, sporting one of her 40-million identical pairs of black Gap leggings, and roasting carrots at 400 degrees. My Monday through Fridays can be eerily similar. Every morning I brew a double batch of coffee, sip half in the morning with breakfast, then reheat the rest after lunch with a piece of dark chocolate (or honey pecan blondie). Lunch rotates between leftovers, grilled cheese, and eggs, always with a side of greens, and the background noise is either reruns of Barefoot Contessa or NPR. Early evenings mean a quick trip to the gym/grocery store, then dinner. No matter what else is on the menu (last night it was this, and tonight I’m forecasting this), there’s a pan of roasted vegetables on the side, always with olive oil, salt, and pepper, always roasted at 400 degrees. Though carrots are sweet and lovely simply roasted with olive oil, salt, and pepper, I wanted to do something extra special for our rainbow assortment. Currently, I have a very large jar of tahini hanging out in my refrigerator, and I became curious as to how it would behave if I tossed the carrots in it prior to roasting them. If you are unfamiliar with tahini, it is a paste made from sesame seeds that’s used in Middle Eastern cooking, best known to many as a primary ingredient in hummus. Personally, I like to think of tahini as sesame butter, because anything with the word “butter” automatically sounds more delicious, and because it’s consistency reminds me a little of natural peanut butter, one of my favorite flavor pairings with carrots. My new favorite carrot flavor pairing: tahini, along with cumin and curry. The nuttiness of the tahini fused with the sweetness of the carrots and the heat of the cumin + curry makes a dynamite combo. These roasted carrots are comforting, surprising, and addictive. We enjoyed them the first night with simply grilled chicken, then I polished off the leftovers on top of a salad for lunch the next day. Though I’m still brainstorming what adding diversity to my weekdays will mean in the larger picture, in my immediate view, I have Tahini Cumin Roasted Carrots adding variety to our dinner routine. The future is looking tasty indeed. 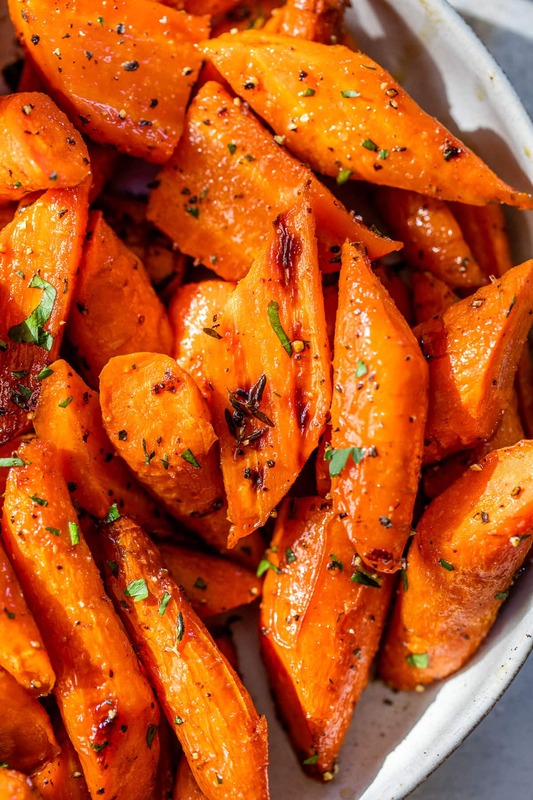 Switch up your roasted carrot routine with these tahini cumin roasted carrots. They're delicious, filled with nutrients, and so simple to make! Preheat oven to 400 degrees and line a large baking sheet with parchment paper or a silicone mat. Set aside. Peel the carrots and trim the ends. If the carrots are very thick, slice them in halves or quarters so that all pieces are similar in size. In a large bowl, whisk together the tahini, olive oil, curry, cumin, and salt. Add the carrots, then with your hands, toss to coat the carrots in the tahini mixture. 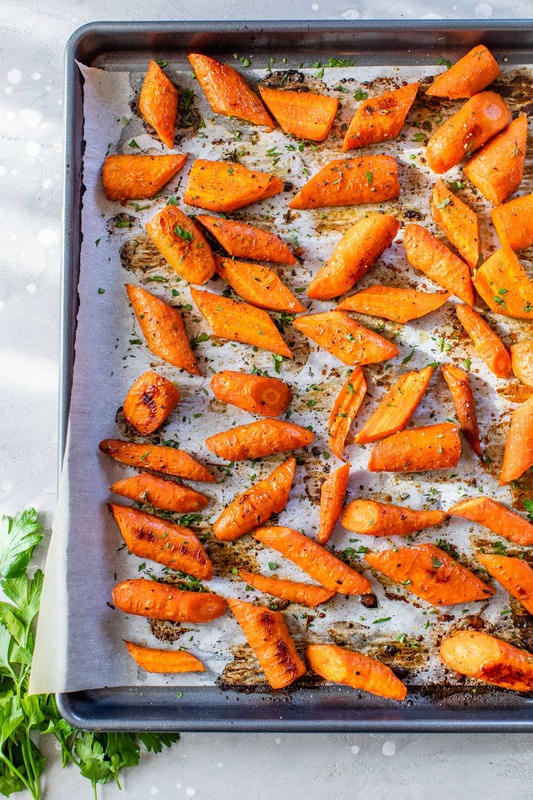 Spread the carrots in a single layer on the prepared baking sheet (use two sheets if needed—do not crowd the carrots, or they will steam instead of browning). 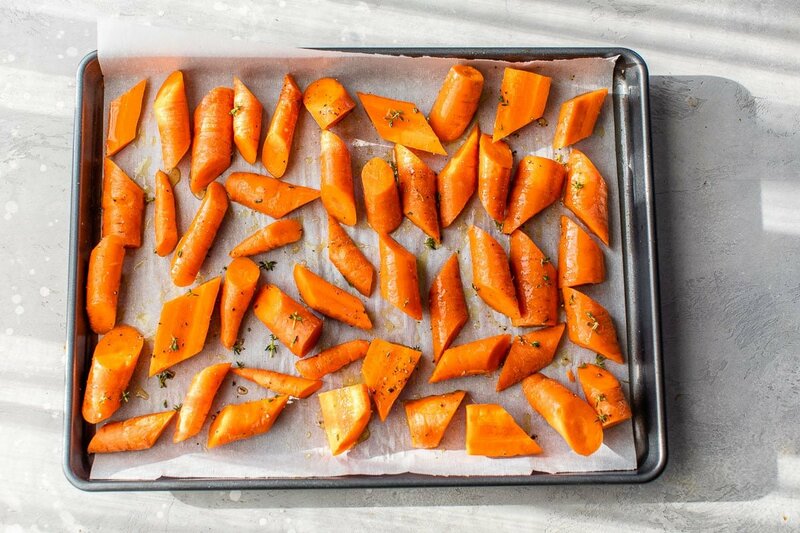 Roast for 20 minutes, flip the carrots over, then continue roasting until tender and golden brown, about 15 additional minutes (35 minutes total). If using more than one pan, switch the pans’ positions halfway through. Serve warm. You know, I never think about buying the different varieties of carrot – I always end up with a lot of the orange ones. Just the difference of color adds a bit of variety to dinner. Roasting them with tahini sounds like a good idea. It’s so easy to fall into the same patterns at home. These are beautiful, Erin! I LOVE roasted carrots. Roasted veggies are a staple side-dish around my house too! You are too kind Kate! Thank you so, so much. Oooh wait does this mean I should get some Gap leggings? I just got some TJ Maxx leggings and they’re alright, but I’m looking for THE BEST. Hey girl these look and sound really good!! Yummy!! I’m definitely stuck in a rut when it comes to the vegetable sides I most often prepare, but this recipe should help me break out of that a bit! I’ve always got tahini around for making hummus, so this is perfect! Roasted veggies are definitely part of my weekday routine too! 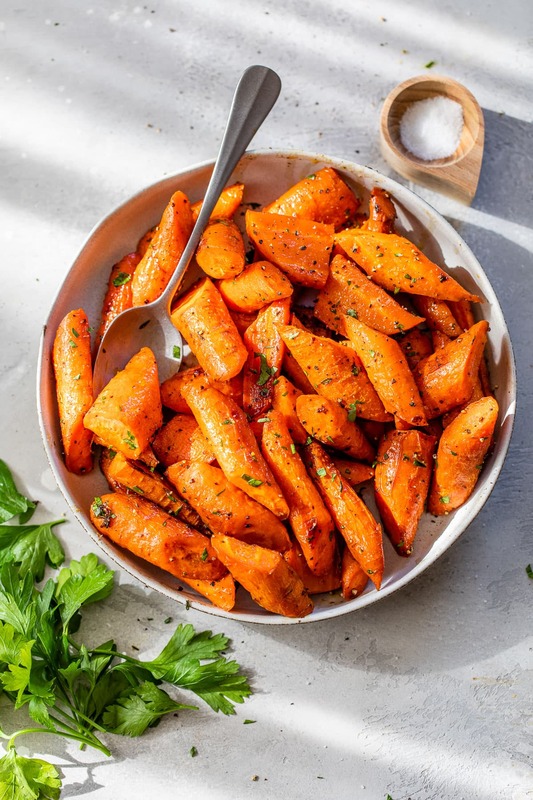 My typical go-to is brussels sprouts and sweet potatoes, but I love the idea of roasted carrots. And with tahini? Such a great idea! I LOVE this post! My bf & I are carrot fanatics, & I just so happen to have TJ’s tahini sauce in the fridge. Also, the rustic turquoise board is absolutely perfect! I swear that photo ought to be framed. The carrots shine beautifully against it. Thanks, Erin! Last week at this fancy restaurant, they had multicolored heirloom roasted carrots on the menu with a goat cheese “fondue,” which turned out to be more the consistency of hummus. I’m a sucker for roasted carrots, so of course I ordered it. Was more excited about the carrots than my main dish! And generally, that’s my feeling. I love roasted veggies, and this recipe is a great one! Ditto the comments on the great photo! Love the idea of tahini on these carrots. And with all of the spring carrots I’ve been seeing, I’ve got to try this! What a fun way to have carrots! Love!!! Oh Erin I am the same – when I choose to be out in the world give me lights, camera, action! When I’m home from work give me gym time, Netflix, and time with Gunther (the kitcheaid) – oh and my boyfriend too! You got your new photo boards! Yay! They look awesome! and so does these carrots! My kinda flavors, right here!